Olney Town brought the curtain down on their home campaign for the season with a hard earnt win over Blackstones to go above their guests into fifth place in the United Counties League Division One table, and at the same time bid a fond farewell to the Olney committee who all stand down at the end of the season. Writes Sportsshots.org.uk, chairman Paul Tough was on the pitch at the final whistle to congratulate every single member of Neil Griffith’s squad, and now the future for the club remains unclear as it waits to see if any new committee members materialise to take the club on. In a turbulent season for the club, the win extended their unbeaten spell to five games, and with two games left a top five finish is possible although most clubs around them have many games in hand, but still a very good finish considering they were mid table just a few weeks ago. The home side got off to the best possible start and scored after just five minutes, a Chris Pendry cross from the right found Jay Saunders at the back of the six-yard box who had time to compose before smashing past Blackstones keeper Aaron Bellairs. They almost doubled their lead two minutes later when Kevin Owusu fed in Drew Mitten inside the 18-yard box, he had time to control before firing narrowly over the crossbar. Blackstone were probing with balls over the Olney defence and saw Joseph Papworth away with an ideal pass, however he was closely tracked by Town defender Robert Tapp who managed to get round and knock the ball back to his keeper Jack Taylor just as Papworth seemed destined to shoot. Tapp then headed away another Blackstones cross and 12 yards out their striker Lee Clarke tried the acrobatic overhead kick but only lifted the ball high over the bar. Just past the half hour mark Blackstones released Filip Czerwonka down the left channel, away from his marker he advanced in on Taylor but hesitated too long before shooting, the keeper getting down well to his left to stun the shot and a defender on hand to clear. A free kick then to the visitors saw Ben Porter drive inches wide of Taylor’s left hand post, and moments before the interval they won another free kick inside the Olney half, Porter seized the initiative and took the kick before Olney regained any shape, sending Clarke away down the left who fizzed the ball across the area but none of his team mates were forward enough to get the touch to test Taylor, and the ball rolled harmlessly away. 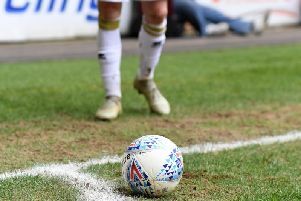 There was still time for Olney to win a corner, Mitten laid the ball back to Owusu who drove the ball diagonally across the Blackstones box, running in late centre half Oscar Friell was a whisker away from connecting some eight yards out. Four minutes after the break Jack Taylor was forced to dive away to his left to save from a header from a free kick, before another cross from their right was met in front of goal by Clarke who headed over, who then chastised himself after realising what a golden opportunity it had been. Olney then doubled their lead on 54 minutes, and Blackstones were the architects of their own downfall, keeper Bellairs tried to play the ball out to his centre half Harry Peasgood, the ball rather short invited Christian Smail to press and his crunching tackle on the edge of the eighteen yard line saw him win the ball, despite the calls for a foul the Olney skipper headed for goal and spotting Bellairs advancing he executed an exquisite chip over his head and in. A corner to Olney then saw some head tennis in the box resulting in Friell heading backwards towards goal, Bellairs having to leap and tip over his own crossbar for a corner. At the opposite end a cross from the Blackstones right was met at the near post by the visitors skipper Jake Pell who headed over. Pell then kept his side in the game at the other end, as Saunders was played in to the right of goal, just as he shaped up to shoot Pell managed to recover and get a block to divert for a corner. As time ticked away, a tackle out on the Olney left wing left most on the pitch waiting for the whistle for a free kick, but it never came and instead substitute Frank Baidoo raced away with the ball towards goal, however Bellairs came out to meet the front man and bravely dived at his feet, the ball bouncing off the keepers legs back on to the Town man and out for a goal kick. As the clock ticked into the ninetieth minute Blackstones pulled a goal back, Clarke got away down the left and into the area, he smashed at goal and despite Taylor getting his hand to the ball he couldn’t prevent it from nestling in the bottom corner. As the away side tried to hassle for an unlikely equaliser, they were almost caught on the counter when Baidoo broke from a stray pass in midfield, despite being called to travel into the corner to waste time, the striker headed for goal and from twelve yards forced Bellairs into a good save down to his left. The remaining seconds saw Olney retain possession in the corner, and the final whistle brought not only three points to the home side, but an emotional farewell to the 2017/18 season, and a long summer that holds a most uncertain future for the club.